Recombinant full length protein (His-tag) corresponding to Rat ERp29. WB: MDCK, HepG2, NIH/3T3, A549, MCF7, A431 and HEK-293 membrane-enriched extracts; HEK-293 cell lysate. ICC/IF: HepG2, HMVEC, NS-1 and p19 cells; rat thyrocytes. Our Abpromise guarantee covers the use of ab11420 in the following tested applications. WB 1/2500. Detects a band of approximately 29 kDa (predicted molecular weight: 29 kDa). 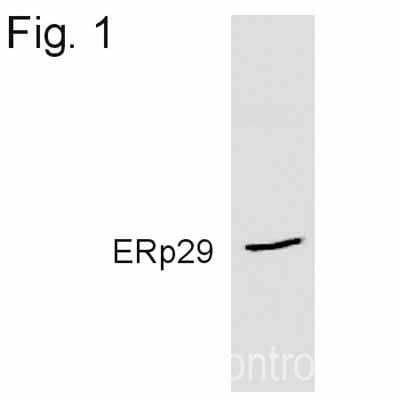 This antibody detects an 29 kDa protein representing ERp29 in rat liver homogenate. Immunofluorescence data demonstrates that ERp29 is localized to the ER of rat thyrocytes using ab11420. 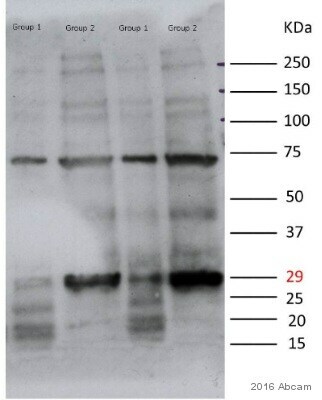 Western blot of ERp29 in HEK cell lysate using ab11420. ICC/IF image of ab11420 stained HepG2 cells. The cells were 100% methanol fixed (5 min) and then incubated in 1%BSA / 10% normal goat serum / 0.3M glycine in 0.1% PBS-Tween for 1h to permeabilise the cells and block non-specific protein-protein interactions. The cells were then incubated with the antibody (ab11420, 1/1000 dilution) overnight at +4°C. The secondary antibody (green) was Alexa Fluor® 488 goat anti-rabbit IgG (H+L) used at a 1/1000 dilution for 1h. Alexa Fluor® 594 WGA was used to label plasma membranes (red) at a 1/200 dilution for 1h. DAPI was used to stain the cell nuclei (blue) at a concentration of 1.43µM. Immunocytochemistry/Immunofluorescence analysis of HMVEC cells labeling ERp29 with ab11420. Immunocytochemistry/Immunofluorescence analysis of NS-1 cells labeling ERp29 with ab11420. Immunocytochemistry/Immunofluorescence analysis of p19 cells labeling ERp29 with ab11420. Immunocytochemistry/Immunofluorescence analysis of rat thyrocytes labeling ERp29 with ab11420. Publishing research using ab11420? Please let us know so that we can cite the reference in this datasheet. Using in IHC-Fr on confocal microscopy, mouse samples. Thank you for your telephone call yesterday afternoon. 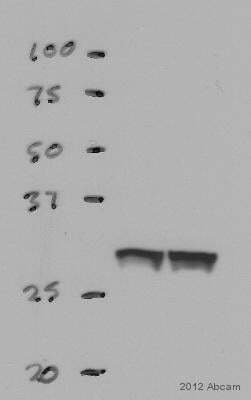 ab48394 LC3B antibody, ab24170 LAMP1antibody andab11420 ERp29 antibody are all rabbit polyclonal. Polyclonal antibodies contain mainly IgG isotypes, soyou need toselect an anti Rabbit IgG tested in IHC-Fr. I have selected some FITC conjugated anti rabbit IgG antibodies that are tested in IHC-Fr. I can suggest to review the online datasheets for further information. Please check that your confocal microscope will detect FITC. Also, if you require any different conjugates, please let me know and I can provide a further list for you as we have many available. https://www.abcam.com/index.html?datasheet=6717 (or use the following: https://www.abcam.com/index.html?datasheet=6717). https://www.abcam.com/index.html?datasheet=7086 (or use the following: https://www.abcam.com/index.html?datasheet=7086). The ab14705 MTCO1 antibody [1D6E1A8] and ab2861 SERCA2 ATPase antibody [2A7-A1] are both mouse monoclonal IgG2a. We have no anti mouse IgG2a secondaries tested in IHC-Fr, but in this case you canuse a general anti-mouse IgG.I have selected an FITC conjugated secondary, but again please let me know if you would prefer other conjugates as we have many available. https://www.abcam.com/index.html?datasheet=6785 (or use the following: https://www.abcam.com/index.html?datasheet=6785). Both ab2861 and ab14705 are mouse antibodies. These are tested successfully in mouse, and so I would like to reassure you we can provide our guarantee for the results. However, because you are staining mouse tissue, I can suggest it may be better to select primary antibodies that are not raised in mouse. 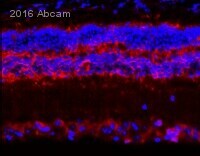 When you add the anti-mouse secondary during the staining, it is possible this can bind to mouse antibodies within the tissue and give some background staining. I am sorry there are no alternatives for the MTCO1. I hope this will be helpful. If you require any further information or assistance, please do not hesitate to contact us (mailto:technical@abcam.com). What?s the accurate concentration of ERp29 in your product ab11420? Thank you for your enquiry. Unfortunately the IgG concentration for ab11420 has not been determined. However, I would estimate that the concentration is between 1-2 mg/ml. I apologize that I could not be of more assistance.